If you are looking for a bike for your daily commute, then you will need a bike that is comfortable, durable and one at that is at a price that fits your budget. Gone are the days when you had to settle for a standard mountain bike or a road bike for your ride to work, there are now commuter bikes that are designed specifically the job. In this commuter bike reviews guide, we look at three of the best commuter bikes and give you our honest appraisal of each one and, if you think that any bike will make a good commuter bike, we also explain the benefits that a commuter bike has over a regular mountain bike or a road bike. We start our Commuter bike reviews, with a commuter bike for the ladies. 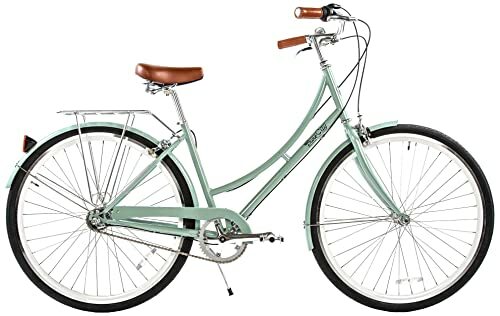 The Schwinn Discover Women's Hybrid Bike manages to combine the toughness that is needed to cope with urban roads with the style of a classic looking ladies bike. It has a sturdy frame that will soak up the bumps in the road and shock absorbing front suspension that will cushion the blow of the inevitable potholes and manhole covers. 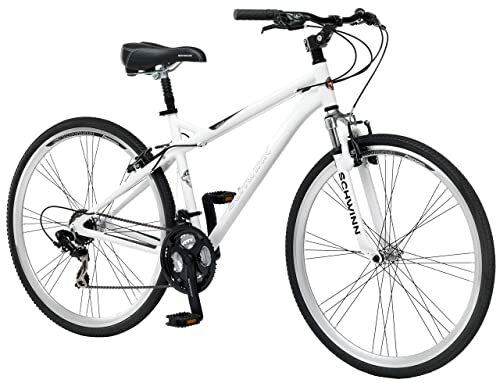 For added comfort, the Schwinn Discover Women's Hybrid Bike also has seat post suspension and a padded saddle. This stylish commuter bike will be just at home on a ride in the park as with will be on the city streets. Gear changes are easy with the 21 speed Shimano twist shifters and Shimano rear derailleur and there is plenty of stopping power from the ProMax linear pull brakes. The fenders are sensibly sized to keep the splashes at bay and there is a ready-fitted rear rack for carrying bags to and from work. 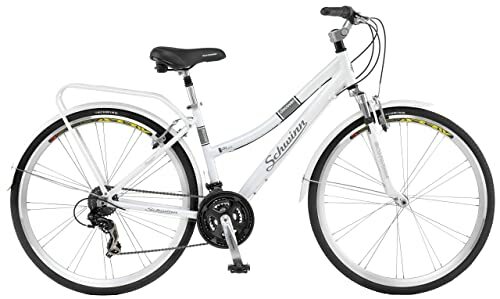 The Schwinn Discover Women's Hybrid Bike is designed for multi-purpose use and it really does fit the bill. Although you would not want to do any serious mountain biking on it, it will cope with some moderate off-road biking. 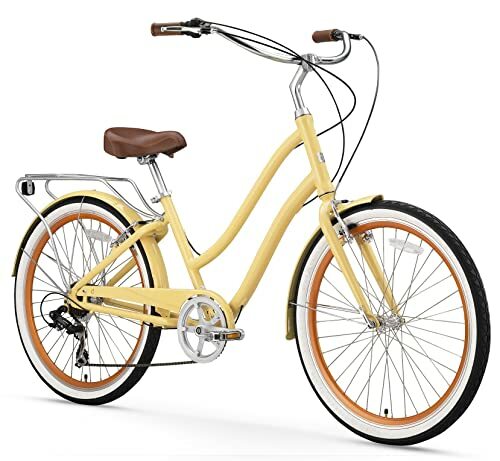 The Pure City Dutch Style Step-Thru City Bicycle is one of the best commuting bikes for women. It looks great and the step-thru design of the frame means that mounting and dismounting the bike can be done with elegance and panache. The bike is available in a range of different colours and you even get to choose between a 1-speed bike, a 3-speed Shimano Nexus Twist Shifter or an 8-speed Shimano Twist Shifter. The Pure City Dutch Style Step-Thru City Bicycle isn’t all about style, though, it’s also been built to withstand the rough, tough city streets as well. It has an upright riding position for cruising and a strong hi-tensile steel frame to cope with a rough ride. The bike also comes complete with all the in-city riding essentials. It has good sized, colour co-ordinated fenders, front and back, a rear rack, reflectors, and cute little silver bell too. The Pure City Dutch Style commuter bike has a nice, upright riding position and the swept back handlebars will mean that you get a relaxing commute. It’s the little touches that make this commuter bike so special, like the old-style leather saddle, leather handlebar grips and, of course the cute silver bell. We finish off our best commuter bike reviews with a commuter bike for the men; the Schwinn Men's Network 3.0 700C Wheel Men's Hybrid Bicycle. 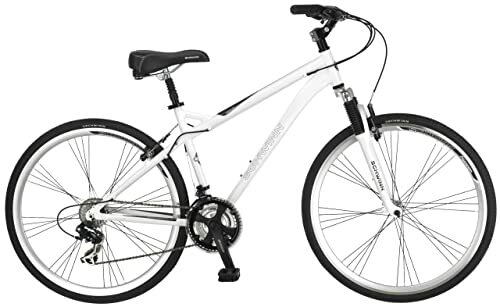 This bike combines the best of a road bike and a mountain bike with the comfortable riding position that you need for a bike that is going to take you safely on your daily commute to work. The bike has a hybrid aluminium frame and the swept back handlebars provide the perfect cruising riding position. The alloy rims are nice and lightweight and the front wheel has a quick release mechanism. 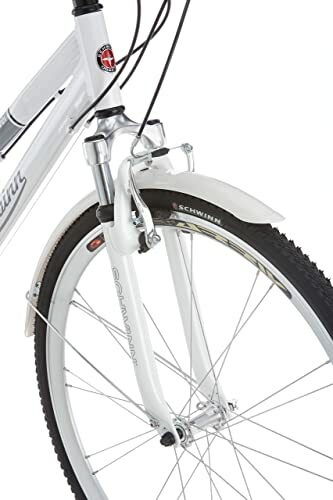 To smooth out the bumps in the road, Schwinn Men's Network Men's Hybrid Bicycle has front fork suspension and a comfortable padded seat. You get smooth and quick gear changes with the Shimano 21 speed rear derailleur with Shimano EZ-Fire shifters and the linear pull brakes will bring you swiftly to a halt in an emergency. This commuter bike also comes virtually already assembled. You get a good set of instructions too. For the price that you pay for the Schwinn Men's Network Men's Hybrid Bicycle, you get a good and solid city commuter bike. Most of the best commuter bikes are what is known as hybrid bikes, which are bikes that take some of the features of a mountain bike and some of a road bike. A road bike is designed for speed, so I will be lightweight and the riding position will be low to reduce drag. A mountain bike, on the other hand is built for rough, off-road terrain, so it is tough and the riding position is designed for maximum control. The best commuter bikes are designed specifically for the city roads. They are tough enough to take some of the bumpy conditions that you find on many city streets and they also have design features to make the ride as comfortable as possible, such as front-fork shock absorbers and comfortable seats. Road bikes and mountain bikes are sports bikes, whereas a commuter bike is a functional bike. For that reason, the riding position is upright and comfortable, unlike the low, aerodynamic potion that you would expect with a road bike. You will also find that a commuter bike will have larger fenders to keep your clothes clean and dry, a chain guard, and a rear fitted rack to hold luggage. We hope that you found this commuter bike reviews guide useful. There is no doubt that, if you intend to ride a bicycle into work every day, it really is worth investing in a bike that was designed specifically for that purpose. A good commuter bike will sturdy enough for daily use and it will a lot more comfortable to ride than a mountain bike or a road bike. More and more people are taking to the road on bikes for the daily commute into work. It’s a greener way to travel than a car, it’s cheaper and, in a lot of modern congested cities, it’s quicker too. If you buy the right kind of commuter bike, there’s no reason why riding a bike to work shouldn’t be convenient and relatively comfortable too.